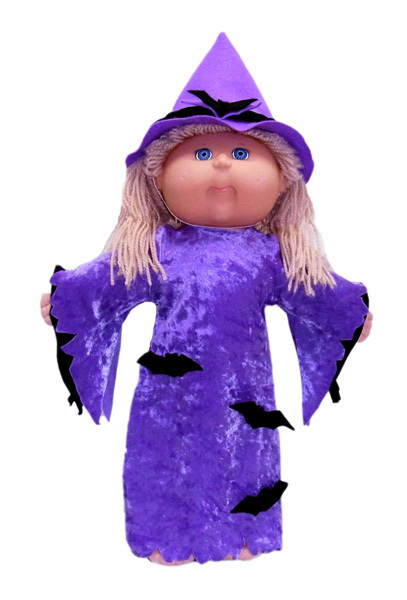 We all love Halloween and I have the perfect Cabbage Patch Kid Doll Clothes patterns so that you can take your doll with you when you go ‘Trick or Treating’? This new Witches Costume Pattern is easy to make and is sure to get you extra candy….the doll needs to collect her own candy too! This costume includes pattern pieces and instructions for the scary witches dress, the creepy witches hat and a template for the spooky bats. When you purchase this downloadable PDF pattern and written instructions, I also give you LIFETIME access to a video tutorial streamed via my website where I show you step-by-step how to make this cool Witches Costume and Witches Hat. Enjoy sewing my Cabbage Patch Kids doll clothes patterns and I look forward to seeing some of your creations.